In the United States, food waste is a staggering problem. Approximately 20 percent of the nation’s cropland is used to grow food that isn’t consumed, according to the Natural Resources Defense Council. Wasted food produces more greenhouse gases than 37 million cars. 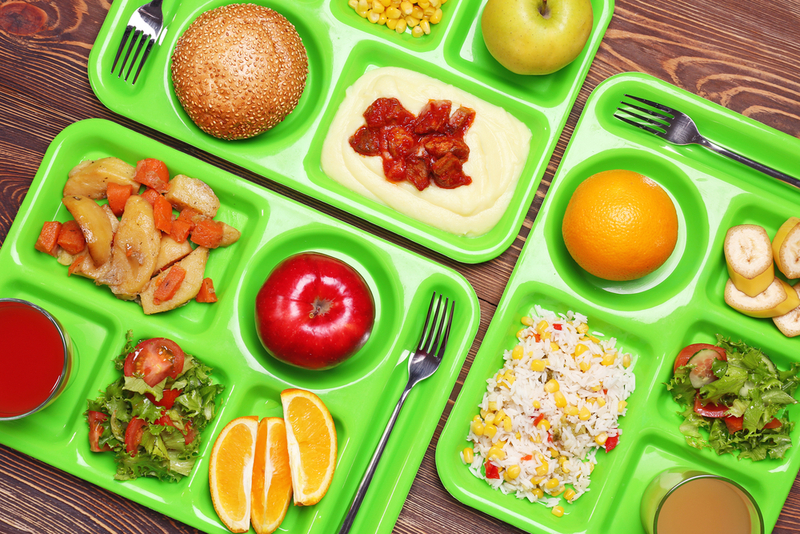 School nutrition programs are a key touchpoint in reducing food waste, not only in how meals are served today, but in teaching children mindful eating strategies they can use lifelong. But it can be tough to implement strategies for reducing food waste in schools while still meeting federal school lunch nutrition standards and health-code regulations — and keeping kids happy! Setting up a sharing table, where kids can place items they are not going to consume (milk, packaged items, or fresh fruit; only USDA food is allowed). Not pushing milk on children who don’t want it. Enlisting students’ help in reducing food waste with waste weigh-in competitions, taste-testing sessions for new menu items, etc. But what about the back of the house? Here are some best practices finding success in local school districts. Since the 1970s, the Minneapolis school system had used a centralized kitchen that sent packaged meals to schools for re-heating. In the last five years, the system’s Culinary and Wellness Services shifted toward on-site cooking, embarking on major kitchen renovations at 33 of the district’s 70 schools. “Food cooked on site is generally deemed to be more appealing to students and is wasted less, according to Culinary and lunchroom staff,” a report found. As part of this initiative, the school system plans to host in-school “field trips” to the cafeteria kitchens so kids can see how food is prepared. Offering sliced fruit can increase student consumption by about 70 percent, according to SmarterLunchrooms.org. It’s more appealing to kids, fits small appetites better and, compared to a whole apple or orange, is less tempting to toss. Keep presentation in mind: attractive displays move fruit faster than stainless-steel bins. Let kids customize their meals. In Charleston County, the problem was time: short lunch periods and long lines discouraged kids from buying, let alone eating, school lunch. Kids “like choices, but not too many choices,” observes Nutrition Services Officer Jeremy Tunstill. Focus-group testing revealed that the best strategy was serving simple meals and allowing kids to customize them. In 2018, the district rolled out condiment stations and topping bars after the point of sale — serving add-ins such as jalapeños, olives, queso and pico de gallo on nacho day. A surprising side effect of this approach was reduced food waste in school lunches. Fully 70 percent less waste was measured in the pilot program at a large high school when students were permitted to put toppings on their own entrees, instead of having servers do it. For years, federal guidelines said fruit smoothies could not contribute toward the milk or meat/meat alternate requirements at breakfast. But, because smoothies are both healthful and hugely popular with kids, the USDA updated its rules. As of 2015, milk, yogurt, fruit and vegetables (subject to certain criteria) served in smoothies can be credited toward meal pattern requirements. Having a powerful culinary blender in school kitchens — such as the EXPEDITOR™ 1100S — makes it easy to turn produce and other ingredients into smoothies. Load-sensing technology and precision controls deliver a perfect blend, every time. And because the EXPEDITOR includes a lifetime warranty on the blade and motor drive coupling, school systems know their investment will pay off. A blender can also be a powerful tool in repurposing fruits and veggies from the share table into future meals (subject to USDA best practices, of course). One Maine school district revamped its approach to nutrition — and dramatically increased the number of students eating school lunch — by giving its kitchen and menus a makeover. Director of School Nutrition Jeanne Reilly obtained grant money to outfit the kitchens with new equipment, then taught staff to make more meals from scratch, Food Management reports. In an annual culinary boot camp, nutrition staff learn knife skills and speed-batch cooking techniques. The kids are included too! Grant money also funded an after-school culinary club, in which nutrition staff teach students how to make popular lunch items at home. Preserve food with a commercial-quality vacuum packaging machine. A vacuum-chamber sealer, like the PrimaVac™ line from Hamilton Beach Commercial, can be a powerful ally in preventing food waste in schools. Because oxygen is excluded and moisture is retained, vacuum-packed food keeps significantly longer than food that’s conventionally packaged. (It’s essential to follow food safety guidelines and train kitchen staff in safe handling practices when using vacuum packaging.) Preserve fresh produce — or freshly made foods — by sealing and freezing. Marinate meats in the bag to eliminate mess and cross-contamination. Foods can be precisely portioned before sealing to reduce food waste and control costs. Potential uses are almost endless — download our free ebook, 28 Inspired Applications for a Vacuum Chamber Sealer. Discover more Hamilton Beach Commercial solutions for K-12 and college foodservice applications.